Chief William Daisey welcomes runners and offers a prayer for the journey. The Nanticoke, meaning tidewater people or people of the tidewaters, are a Native American people who traditionally resided in Chesapeake Bay and Delaware. Now, they are dispersed being part of the federally recognized (1) Six Nations of the Grand River First Nation in Ontario, Canada, (2) the federally recognized Delaware Tribe of Indians in Oklahoma, (3) the state recognized Nanticoke Indian Association of Millsboro, Delaware, and (4) the state recognized Nanticoke Lenni-Lenape Indians (See also the Nanticoke Lenni-Lenape Indians website) in New Jersey. 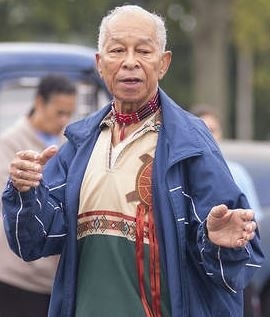 The Nanticoke Lenni-Lenape Indians are headquartered in Bridgeton, Cumberland County, New Jersey, where they also operate a tribal store, the “Turtle Trading Post.” They also have tribal grounds, called “Cohanzick,” in Fairfied Township, New Jersey. The majority of Nanticoke people are evangelical Christians, and the websites unashamefully recognize the commitment to Jesus Christ. Pray Nanticoke Christians will obey the Great Commission taking the gospel to all peoples. Pray Nanticoke Christians to grow strong in the faith and pass their faith in Christ to younger generations of Nanticoke.